Whenever there is a Pacquiao fight, I remember seeing cafes and restaurants marketing special deals for people who would like to watch the match via live streaming. These deals are usually priced at Php500 and above, inclusive of the viewing and a meal. But what if there is a bar and restaurant that actually live streams ALL sports events, local and international, without the hefty price tag? Somewhere where you can cheer for your favorite team while eating a whole slab of Striploin, perhaps? Champions Sports Bar and Restaurant has this very unique concept. 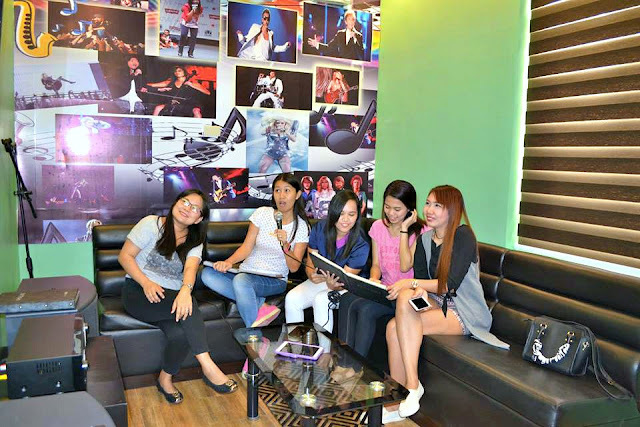 Located in Metro South subdivision, Manggahan, General Trias, Cavite, this sports bar is in a quite isolated location. It caters mostly to golfers in the nearby Eagle Ridge Golf and Residential Estates, and is also a venue for corporate meetings of businessmen and some politicians. But don’t worry, you don’t need to be rich to afford eating here, read on and look closely at the prices of the food they offer. The place itself has a bright and inviting atmosphere. It boasts mainly of beige, black, and red tones, with framed sports memorabilias like one of Manny Pacquiao’s signed boxing glove and a swimsuit worn by Australian Swimmer of the Year Susie O’ Neill. 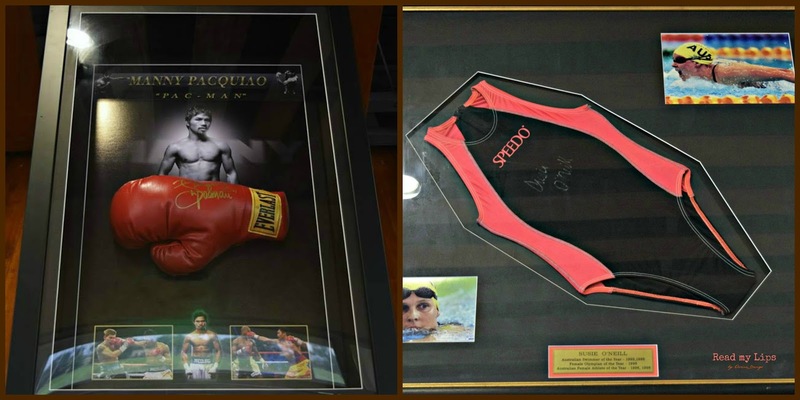 All of the memorabilias are original, which the restaurant owners bought from collectors here and abroad. 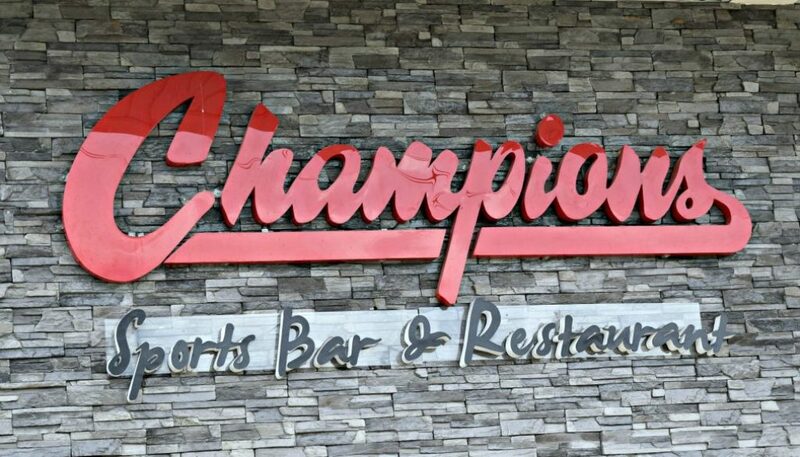 Champions Sports Bar and Restaurant looks elegant without being too intimidating, considering that it is a fine dining restaurant. Designed with the customers’ comfort in mind, the seats are very wide, both in the dine-in tables and at the bar. 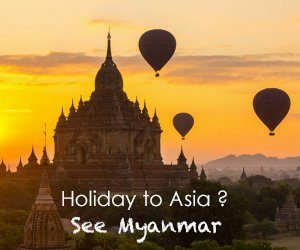 It is a place where you can pass time with good food, strong Wi-Fi, and entertaining TV shows. The entire seating capacity of the store is 140 which could get really crowded when else: when there is a big sports match happening. We dined-in for Sunday lunch and it was very fortunate that not a lot of customers were around. For the food, I expected some Instagram-worthy gourmet food on the menu, and I wasn’t disappointed. 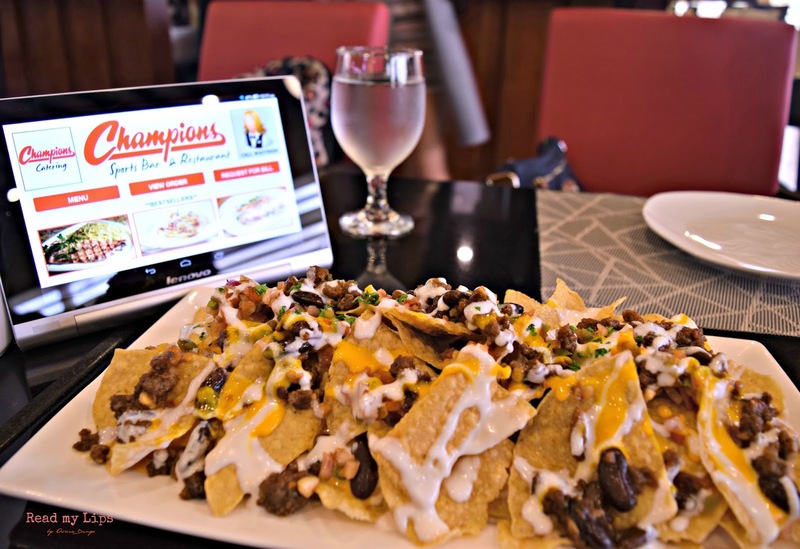 In fact, their menu itself deserves a mention: they use digital food catalogs in small tablets where customers can conveniently tap whatever their order is and add to their cart. They can also use this gadget to surf the Internet! Again, another unique concept. For the appetizer, we got Caesar Salad with Grilled Chicken Php240 and Chili Beef Nachos Php320. Both are of hefty proportions which are enough for 2-3 people. The salad boasts of in-house mayonnaise concocted by Chef Ynan del Rosario. I appreciate that the dressing isn’t very salty, the vegetables are crispy, and it’s something that you wouldn’t get tired of eating. With the nachos, I find the refried bean and sour cream topping as very refreshing. This dish stays away from the conventional nachos we all are familiar with. I must say that the appetizers alone are very filling. But really, who wants nachos for appetizer? The Chili Beef Nachos is best partnered with Draft Beer available at the bar. For the main dishes, we were served with Baby Back Ribs, Angus Beef Tenderloin, and Norwegian Salmon. The store’s best seller. It is relatively and surprisingly cheap at P525, with tender meat which falls right off the bone and evenly-distributed sweet chili sauce. It was served with medium-cut fries, which for me, is a little bland.Or am I just used to overly salty French fries from fast food joints? That, I don’t know. 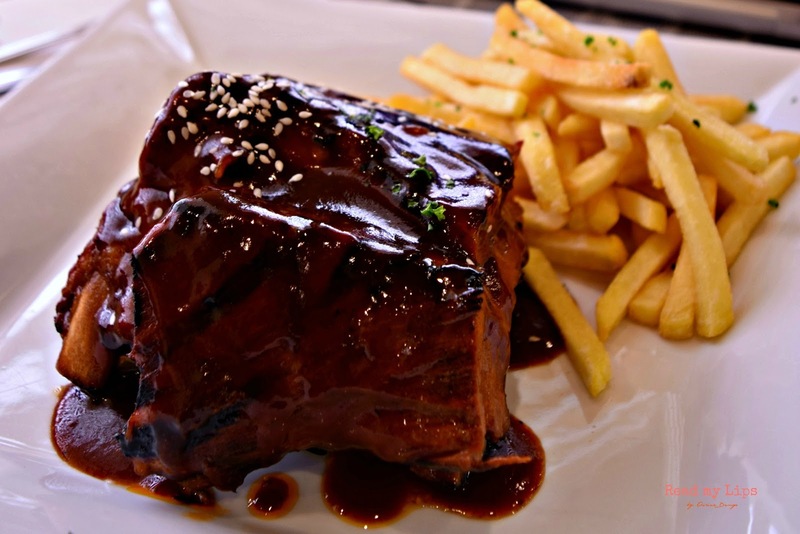 But actually, the fries’ plain flavour made the dish even more tasty as the focus was given entirely to the ribs. If you would like to eat “your ribs” with rice or mashed potato, that’s possible: just request for it upon ordering. The Norwegian Salmon Php 435 is my second favorite dish, if you would ask. It looks so pretty with glazed asparagus, cabbage, and beurre rouge sauce. But apart from the appearance, what I like about it is the sweet sauce that complements the very modest salmon taste, as well as the crisp veggies. There was an explosion of flavors in every bite. The highlight of this dish is the beurre rouge sauce: made of cream, butter, and reduced red wine. Let me repeat that: red wine with vegetables. I’m saving the best for last. My favorite main dish is the Angus Beef Tenderloin with mashed potato, grilled vegetable and red wine sauce Php 1800. The beef was unbelievably tasty, it wasn’t surprising that it was priced like that. I’m not particularly fond of mashed potatoes, but Champions’ has a very mild taste which is almost flavorless. You know when you eat rice and it matches perfectly with the viand? That’s how perfect together these two are. I know this isn’t the most photogenic angle, but I swear it certainly delivers on taste. To cap off all these tasty treats, we got Champions’ Classic Tiramisu Php 180, Mango Crepe with Vanilla Ice Cream and Toffee Caramel Sauce Php 200, Blueberry Cheesecake Php 180, and Strawberry Panna Cotta Php 200. I particularly like the Strawberry Panna Cotta: very creamy with the right amount of sweetness. My companions and I were all slightly surprised with the price as it was a little expensive for a coffee cup treat. But upon asking my sister, who is a Hospitality Management student, she said that it is something that is extremely difficult to prepare. So ok, high price tag forgiven. I believe that the Desserts Department is where Champions Sports Bar and Restaurant should improve on. Most of the above mentioned desserts tastes very much the same as the usual desserts available everywhere. They were sweet alright, but with all the treats in the market today, I think there weren’t anything extraordinary about them. Even if you are no sports fan, Champions Sports Bar and Restaurant still has something for you. They have two Karaoke rooms which could house at least 12 people each. The rate is Php 2,000 for the first hour, and P500 per hour thereafter. This rate comes with 15 bottles of beer, Buffalo Wings, Chili Cheese Beef Nachos, and Hawaiian Pizza. Yes, I hear you: 2K is not that bad, indeed. This restaurant has more to offer for music lovers. Every Wednesdays and Thursdays are Jazz Nights, while Friday is Acoustic Night. They have live bands who perfom for the guests every Friday and Saturday. They also do catering for events, big or small, inside or even outside the restaurant. Champions Sports Bar and Restaurant was the brainchild of Australian owner Earl Woolley and his Filipina wife Bernie. Both golfers and sports enthusiasts, they got tired of home-cooked meals, but find dining in Tagaytay and Alabang as too far. They wanted a name that is easy to remember and is closely related to sports and upon seeing their trophies from their golf tournaments, came up with the name: Champions. Disclaimer: The food was complimentary but all views are my own.